The Pioneer Era: Specific to those who began their careers before November 17, 2000, when the current rules were largely put into place, is 35 years old and has been retired for at least one year. The Modern Era: Specific to those who have turned pro after November 17, 2000. The Contributors Wing: Specific for non-fighters. Fight Wing: This is for a legendary fight, which has to have take place prior to July 10, 2011. With this in mind, the UFC is now staggering their announcements (brilliant) to generate more buzz for their Hall of Fame and last night at UFC 198, the 2016 Pioneer Era inductee was announced. Entering the UFC Hall of Fame is Brazilian, jiu-jitsu specialist, Antonio, Rodrigo Nogueira, more commonly known as “Minotauro”. Nogueira was a staple of the Japanese Pride Promotion and in 2001 he would become their first Heavyweight Champion, a title he would hold for nearly two years. He would make his UFC debut in 2007, defeating Heath Herring and would later become the interim UFC Heavyweight Champion. He retired with a record of 34-10, was the Wrestling Observer Fighter of the Year in 2002 and is already in the Sherdog and MMA.Freak.com Hall of Fame. We here at Notinhalloffame.com would like to congratulate Antonio Rodrigo Nogueira for receiving this accolade! At UFC 199 last night, it was announced that Don Frye will be part of this year’s UFC Hall of Fame class, which will be inducted on July 10, at the Expo following UFC 200. Known as “The Predator”, Don Frye had a 9 and 1 record in the UFC, most famously winning a tournament in UFC 8, and the Ultimate Ultimate the following year. Frye would later compete in PRIDE, where he had one of the most memorable brawls in Mixed Martial Arts history when he fought Yoshihiro Takiyama. In his career, Frye has defeated the likes of Ken Shamrock, Tank Abbott, Mark Hall and Gary Goodridge. We here at Notinhalloffame.com would like to congratulate Don Frye for achieving this latest accolade. The UFC Hall of Fame has announced its latest entrant into their Hall of Fame, and the third officially in their Fight Wing. The Pete Williams VS Mark Coleman fight from UFC 17 in 1998 will be inducted. The fight saw Williams defeat the heavily favored Coleman with a stiff head kick. The underdog took the fight on two weeks notice and despite taking a severe pounding during the contest only to score a quick win in overtime. This fight joins the Stephan Bonnar VS Forrest Griffin match from the Ultimate Fighter I Finale and the Matt Hughes VS Frank Trigg II contest from UFC 52. The UFC Hall of Fame has announced its first inductee for the Class of 2017, which is Modern Era Candidate, Urijah Faber. Faber, “The California Kid” was one of the first major draws in Mixed Martial Arts. A champion in King of the Cage, Faber would move to World Extreme Cagefighting and would win the promotion’s Featherweight and later the Bantamweight Championship. Once WEC merged with the UFC, he would immediately challenge for titles there. Faber would not win any championships in UFC, but would put forth stellar matches against Dominick Cruz, Brian Bowels and Michael McDonald. Faber currently holds the record for the most wins in the UFC Bantamweight division and is retiring with a MMA record of 34 and 10. There will be more members of the UFC announced in the upcoming weeks. We here at Notinhalloffame.com would like to congratulate Urijah Faber for achieving this honor. The UFC Hall of Fame has announced the second member for their Class of 2017 as former UFC Heavyweight Champion, Maurice Smith has been named to the up and coming institution. A former kickboxing champion in multiple organizations in both the Light Heavyweight and Heavyweight division, Smith would compete in mixed martial arts in the 90’s, most notably in Pancrase where he competed in matches against Minoru Suzuki, Ken Shamrock and Bas Rutten. He would also compete in RINGS and would win the Extreme Fighting Heavyweight Title. He would sign with UFC in 1997 and in his debut at UFC 14 defeating Mark Coleman for the Heavyweight Title in what was considered a major upset at the time. He would successfully defend the belt against Tank Abbott though would lose the belt to Randy Couture in his second defense. The rise of Maurice Smith was significant as he was considered to be the first striker to find success in UFC. Smith retired with a 14-14 record in MMA with a 4-3 record in the UFC. We here at Notinhalloffame.com would like to congratulate Maurice Smith for earning this accolade. The UFC Hall of Fame has announced that longtime matchmaker, Joe Silva will be inducted into the Contributors Wing. Silva’s service with the UFC began in 1995 a consultant and later as the Head of Talent Relations, but the man who Dana White has called the “best matchmaker ever” set up over 3,000 contests in the UFC. He retired in 2016 following the buyout from WME-IMG. Silva, along with the other members of this year’s UFC Hall of Fame Class will be inducted in Las Vegas on July 16. We here at Notinhalloffame.com would like to congratulate Joe Silva for this honor. We have a new member of the UFC Hall of Fame Class of 2017 as it has been announced that Japanese legend Kazushi Sakuraba will be going into the Hall as a member of the Pioneer Wing. Sakuraba joins previously announced Maurice Smith, Joe Silva (Contributor) and Urijah Faber (Modern Era). While Sakuraba competed predominantly in Pride, he did win the UFC Ultimate Japan Tournament two decades ago. Sakuraba would truly establish his legend by defeating Royce Gracie in a ninety minute contest. He would be dubbed the “Gracie Hunter” and would defeat three other members of the famed jiu-jitsu clan. Sakuraba would also defeat Ken Shamrock, Vitor Belfort, Kevin Randleman and Quentin Jackson. We here at Notinhalloffame.com would like to congratulate Kazushi Sakuraba fro achieving this incredible honor. During UFC 223, the UFC Hall of Fame announced that Bruce Connal would be the first member of the Class of 2018. Connal will be inducted in the Contributors Wing, though this will be posthumous as he passed away at 61 unexpectedly this past March. Connal might not be a name known to most fight fans but the longtime producer was one of the most beloved figures in the company. He had produces over 300 live UFC events for the company and he will join Jeff Blatnick, Bob Meyrowitz and Joe Silva in the Contributors Wing. He will be inducted this summer during International Fight Week. The UFC Hall of Fame has announced their latest member to their institution, former UFC Welterweight Champion Matt Serra, who will be inducted on July 5 in the Pioneer’s Wing. Serra first gained major attention by winning The Ultimate Fighter 4 and in the process earning a title shot against Georges St-Pierre, a fight nobody gave him a chance to win. Serra pulled off one of the greatest upsets in UFC history by defeating the Canadian legend by TKO in the first round. Following the win, Serra would become one of the coaches on the Ultimate Fighter 6 and was set to fight opposing coach Matt Hughes but back injuries got in his way and his scheduled title defense against Hughes was scrapped. Serra would not be able to defend his Welterweight Championship for over a year and he did so against St. Pierre in Montreal. This time he would lose to St. Pierre by TKO in the second round. Serra would later finally fight Hughes but he would come up on the losing end via unanimous decision. He would compete in the octagon two more times, with a win over Frank Trigg and loss to Chris Lytle. Matt Serra retired with a record of 11 and 7. We here at Notinhalloffame.com would like to congratulate Matt Serra for obtaining this prestigious honor. During the UFC 225 card it was announced that Ronda Rousey will become the next member and first female into the UFC Hall of Fame. Rousey, who now works for WWE, was arguably the sports first female megastar. She main evented multiple shows and was responsible for hundreds of thousands of pay per view buys. Rousey’s success transcended the sport and she would become a multi-media sensation, bestowing the covers of many magazines, appearing in films and hosting Saturday Night Live. In the octagon, Rousey entered the world of Mixed Martial Arts after winning the Bronze Medal in Judo in the 2008 Olympics. Rousey began her MMA career slowly and shortly after joining Strikeforce she would win the Women’s Bantamweight Championship from Miesha Tate. She would defend her title shortly after by defeating Sarah Kaufman in a contest that did not go past one round. This was a pattern for Ronda Rousey as she would win he first six professional fight in one round. The UFC came calling and she would become the first female signed to UFC. 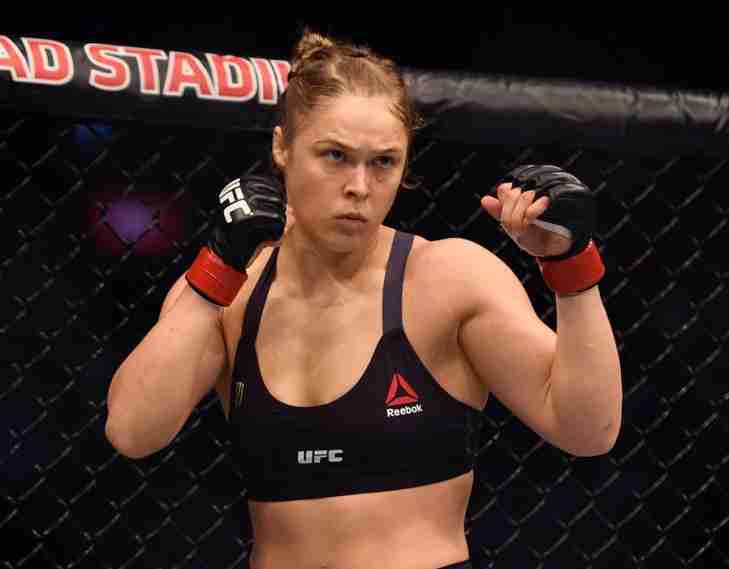 After being anointed by UFC as the inaugural Bantamweight Champion Rousey continued her dominance. She would submit Liz Carmouche in her first title defense and would again defeat Miesha Tate in what would be her only fight that went three rounds. Rousey’s next four title defenses (Sara McMann, Alexis Davis, Cat Zingano & Bethe Correia) would see her destroy her opponents in a combined 2:12, which is possibly the most dynamic stretch in UFC championship history. In what was considered a huge upset, Holly Holm knocked out Rousey in the second round in the main event of UFC 193 and she would fail one year later to take the title back when she lost to Amanda Nunes. This would be her last professional fight. Ronda Rousey retired with a record of 12 and 2 with 11 of her wins coming within one round. While there might be some critics who feel that Rousey is not the pioneer of women’s MMA and should not be the first female inductee she is the most influential female fighter of all time. She will join the hall as this year’s Modern Era inductee. The other inductees are Matt Serra (Pioneers Wing), Bruce Connal (Contributors Wing), Art Davie (Contributors Wing) and Mauricio Rua vs Dan Henderson (Fights Wing). The ceremony will take place on July 5. We here at Notinhalloffame.com would like to congratulate Ronda Rousey on achieving this prestigious accolade. Last night the UFC held their Hall of Fame ceremony and while we don’t (yet) rank those who should be inducted, we always pay attention to what that Hall does. As the UFC announced each of the inductees we discussed it here, but let’s go over the UFC Class of 2018. The undisputed headliner was Ronda Rousey, who without question changed the sport forever and was the first female Mixed Martial Artist to be a bona fide headliner. Rousey’s success transcended the sport and she appeared on multiple shows including a guest hosting gig on Saturday Night Live. She was the first UFC Women’s Bantamweight Champion and she enters as this year’s Modern Wing Inductee. Matt Serra enters via the Pioneer Wing. Serra pulled off what was arguably the greatest upset in MMA history when he knocked out Georges St-Pierre in 2007 to win the Welterweight Title. There are two entrants in the Contributors Wing this year. Art Davie, a former co-owner and Bruce Connal, a longtime producer of the product made the cut. This year’s inducted Fight is the first encounter between Shogun Rua and Dan Henderson at UFC 139 in which the latter won by decision. We here at Notinhalloffame.com would like to congratulate the UFC Hall of Fame Class of 2018. What we here at Notinhalloffame.com consider December to April the “Hall of Fame Season” and part of that are the staggered announcements for the UFC Hall of Fame. The first announcement came last night as Michael Bisping who will enter as the Modern Era inductee and is the first member of the Class of 2019. 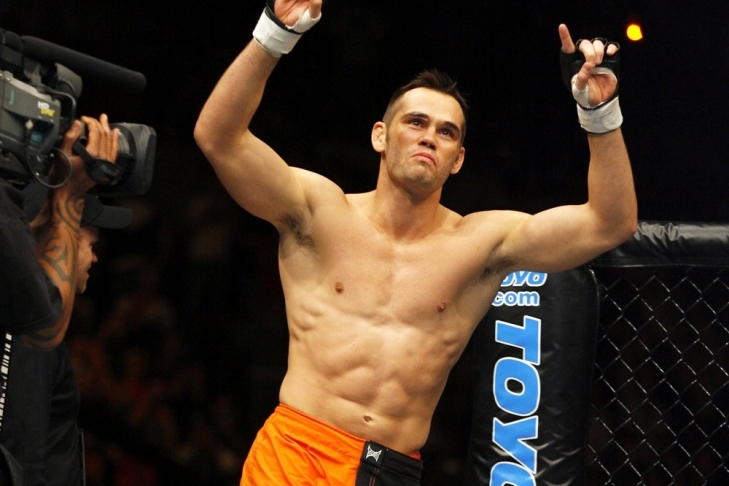 Making his Mixed Martial Arts debut in 2004, he would win Ultimate Fighter 3 two years later as a Welterweight. Bisping would eventually move up to Middleweight and would be a top contender for years, though he always seemed to be one fight away from challenging for the UFC Middleweight Title. High profile losses to Dan Henderson, Wanderlei Silva, Chael Sonnen, Vitor Belfort and Luke Rockhold were offset by big wins over Jason Miller, Cung Le, Thales Leites and Anderson Silva but the title seemed to elude him until UFC 199. On that night, he took a fight on short notice against Luke Rockhold to avenge his previous defeat and win the Middleweight Championship. He followed that up with a successful title defense against Dan Henderson, who beat him at UFC 100. He would lose the title to the legendary Georges St-Pierre at UFC 217 and retired shortly after one more loss. Historically speaking, Bisping is the first (and only) British fighter to win a championship in the UFC and he is without question the greatest British fighter ever. His 16 wins as a Middleweight is a UFC record and four times he would win “Fight of the Night”. 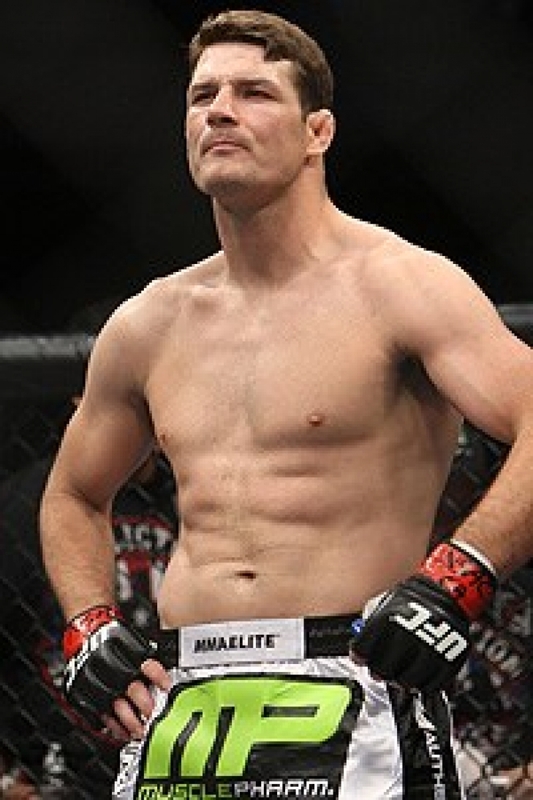 Bisping retired with a record of 30 Wins and 9 Losses. We here at Notinhalloffame.com would like to congratulate Michael Bisping for earning this honor.